9 Aug experimental aircraft Morpheus crashed during a test flight. In the space center of NASA in whose territory occurred the accident, experts are trying to establish the exact cause of the incident. Morpheus aircraft weighing about 1000 kg, intended for testing the latest engines operating on oxygen and methane (environmentally friendly products), new technologies for landing vertical takeoff and maneuvering spacecraft. Morpheus was developed by the Kennedy Center, and private space company Armadillo Aerospace in Florida and it was assumed that on its basis will create new landers for missions to other planets. Over the past two years, the project has invested about $7 million. Just last week the missile and the aircraft successfully completed the first statistical test at NASA Kennedy. And on Thursday, August 9, when he was scheduled the first attempt to test the module in a free environment, missile platform overturned during the takeoff, the wreckage of the machine caught fire, then exploded. 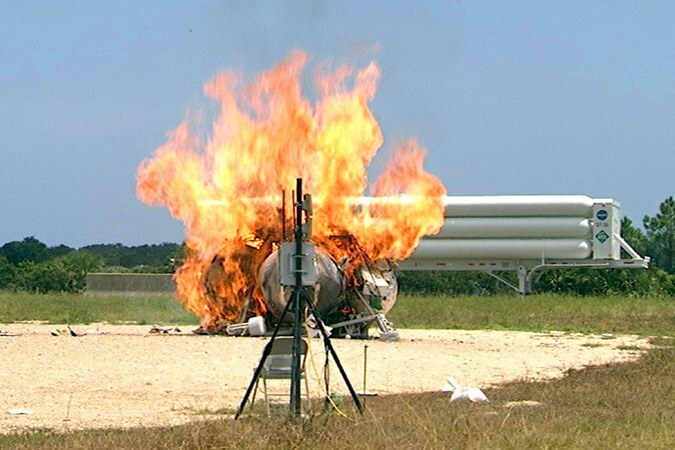 The crash of the apparatus none of the experts who were watching the flight of Morpheus, was not injured and the resulting fire was quickly extinguished caused by the firefighters. To date, experts of the center for NASA studying the data recorded during testing, and trying to establish the exact cause of the incident, which would help to avoid the recurrence of similar accidents in the future. It is already known that the takeoff at the rocket apparatus was disconnected one of the devices, which Morpheus could not go into stable flight. According to a statement published on the website of the space center, such accidents are an integral part of creating any complex spacecraft. Thanks to them, the engineers have the information that subsequently helps to avoid such crashes and improve the performance of manufactured systems.